At St. Chad's we believe that excellent attendance and punctuality leads to better outcomes for pupils. This is also backed up by research that shows pupils who have excellent attendance make better progress than those who do not. Be on the line at 8:40am! It is important that you child is on the line at 8:40am, as our school day starts promptly at 8:45am. Any child arriving after 8:50 will be recorded as late. Children arriving after 9:15 will not receive their attendance mark for the morning's session. 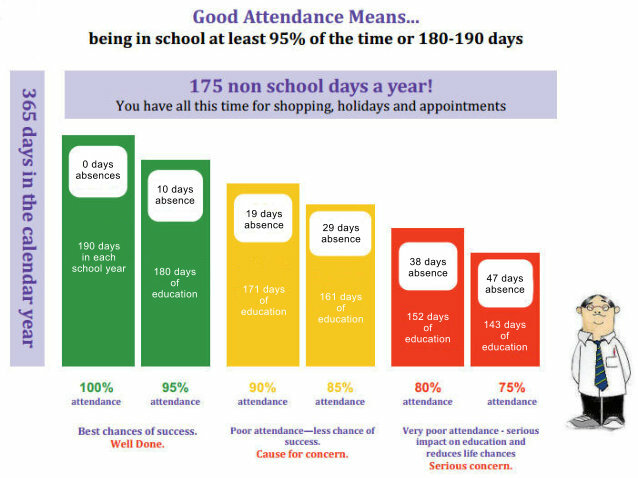 St. Chad's Primary School aims to have a yearly attendance figure of 96%+ and to achieve this, parents must accept that any absence is undesirable. Should your child, for any reason, not be at school we will require an explanation for the absence. We would expect you to telephone the school on the first day of absence by 10.00 a.m. or send an email and a written note when your child returns to school. Should an explanation not be received, the school will investigate to ensure the parent has authorised the absence. As with absence, lateness disrupts a child’s schooling and we will require a parental explanation for lateness. The school will investigate all incidents of lateness that have not been adequately explained. Frequent lateness will be reported to the Education Welfare Officer. Good time keeping means making sure your child is at school and ready to learn, before the bell rings. Did you know? – being 15 minutes late each day is the same as missing two weeks of school! Every School Day Counts but every minute is equally as important! If your child’s attendance or punctuality gives us grounds for concern we will contact you to try and gain your support. However, if the attendance/punctuality continues to be poor we will ask the Schools Educational Welfare Officer to help us to see if we can support you in improving this. The Education Welfare Officer has the power to fine parents or take them to court and in the worst cases this could lead to a large monetary fine or imprisonment. Children who manage to complete a whole year at school without any absence are presented with an attendance badge and certificate in assembly. BEING AT SCHOOL EVERY DAY IS VERY IMPORTANT AND WE LIKE TO CELEBRATE GOOD ATTENDANCE. The headteacher may no longer grant leave of absence during term time except in exceptional circumstances. This means that there is no entitlement for you to take your children on holiday during term time. A Notification of Absence Form must be filled in and submitted to the headteacher, detailing any exceptional circumstances. Clearly there are many situations that may constitute exceptional circumstances but in general we interpret ‘exceptional’ as being of unique and significant emotional, educational or spiritual value for a child which outweighs the loss of teaching time. This interpretation will differ for each individual request. Taking holiday in term time because of reduced cost for parents would not constitute an exceptional reason. Absence during term time should be avoided because children can fall behind with their work and may find it difficult to catch up and integrate into friendship groups. Every lesson in school matters and frequent absence from school results in gaps in children’s learning. However, there are times when absence is unavoidable but we ask you to contact us as soon as possible to explain why your child needs to be absent and then we can decide whether or not to authorise the absence. For further details please see our attendance policy. If you have any further queries about attendance and punctuality, please speak to Miss McCreanor (Attendance Officer) or Mrs Davern (Family Support Worker).